- The Fellowship of the Ring is the first of three volumes of the epic novel in The Lord of the Rings by the English author J. R. R. Tolkien. It takes place in the fictional universe Middle-earth. - Tolkien conceived The Lord of the Rings as a single volume with six sections he called "books" along with extensive appendices. The original publisher made the decision to split the work into three parts. - Tolkien indicated he would have preferred The War of the Ring as a title, as it gave away less of the story. - The discarded title for Book I was The Return of the Shadow or The Ring Sets Out. Book II was titled The Fellowship of the Ring or The Ring Goes South. - In The Lord of the Rings, Tolkien mostly refers to the group as the "Company of the Ring", or "the Company" for short, rather than "Fellowship of the Ring" or "Fellowship". - The novel was adapted in to movie directed by Peter Jackson, that eventually won multiple awards in Academy Awards. 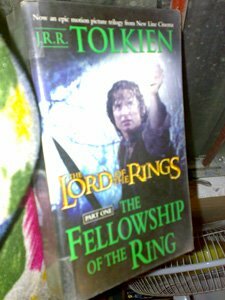 By the time I decided I was already old enough to handle high fantasy, I started reading Tolkien's first Lord of the Rings book -- The Fellowship of the Ring. I cannot imagine how I was able to absorb most of the story as the world created by Tolkien's so vast and rich that an inkling-of-a-mind, like mine, would not be enough to digest it. After my excitement with The Hobbit, it was evident that the sequel would be as good, if not better. If you think that Hobbit is similar with Fellowship, then think again as the latter is intended for mature readers and certainly had a more adult theme compared with the former. Although the same dose of "fantastics" is applied to Fellowship this is a book that should be read with great care and scrutiny for details. The Dark Lord Sauron, forges the "Ruling Ring of Power" in Mordor. In battle it is cut off by Isildur who claims it, but is later killed by Orcs and the Ring falls into the Great River. Gollum murderously obtains The Ring while fishing, and keeps it for a very long time before losing it, when it is found by Bilbo Baggins. Unaware of its origins, Frodo Baggins inherits the ring from Bilbo. Gollum eventually wanders into Mordor while looking for the Ring and is captured and interrogated by Sauron's minions who sends the Ringwraiths to find it. Gandalf learns some of this history and advises Frodo to take the Ring away. Frodo takes his loyal gardener Samwise "Sam" Gamgee, and two cousins Merry and Pippin to help him. On their dangerous journey, they run into many difficulties and are pursued by the Ringwraiths. Various characters give aid along the way, including guidance from a disguised Aragorn, Isildur's heir and rightful king of Gondor. At Weathertop, Frodo is wounded by the Ringwraiths but eventually the company defeat them at the Ford of Bruinen, aided by Elrond master of Rivendell. Frodo recovers under the care of Elrond. The Council of Elrond reveals much significant information about Sauron and the Ring, including the corruption of Saruman, and decides that the only course of action is to destroy the Ring in Mordor. 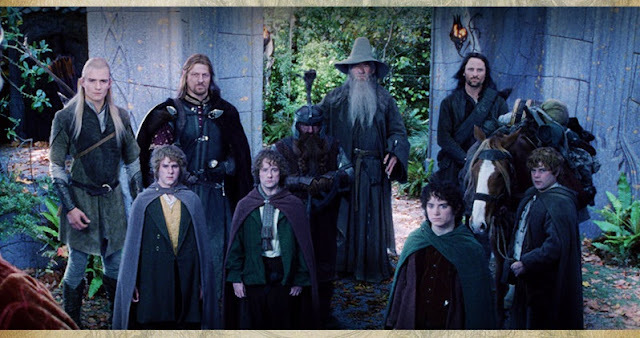 Frodo volunteers to take the Ring, and a "Fellowship of the Ring" is chosen to accompany him. The company is forced to travel through the Mines of Moria where they are attacked by Orcs. Gandalf fights a Balrog and falls into a deep chasm. The others escape and take refuge in Lothlórien. With boats and gifts from the Lady Galadriel, the company then travel down the great River Anduin to the Amon Hen. There, Boromir, heir to the current rulers of Gondor, attempts to take the ring from Frodo who then breaks from the Fellowship and continues the trek to Mordor accompanied only by Sam.